Recycled crafts that turn Jeans labels into poufs addcontemporary vibe, creativity and individuality to home interiors and fillliving spaces with unique charm and character. These recycled crafts areinspiring, impressive, stylish and eco friendly, a perfect way to add uniqueaccents to interior decorating and make a statement. Jeans labels were assembled in the patch-style to abeautifully finished Pouf with high stability and durability. 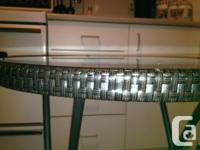 What wasdiscarded or worn is turned into unique, creative and stylish home furnishings. Use it as an ottoman, side table, have a seat or simply useit as a foot rest! It measures16”x16”x16” in size. Each pouf is one-of-kind masterpiece and will slightlydiffer from what is shown in the picture. Price: $2 **CLEARANCE SALE** MODERN LEATHER SECTIONAL SOFA + COFFEE TABLE! 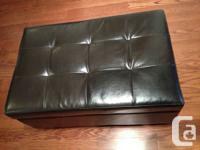 For sale is a Debbie Travis Leather Ottoman/Coffee Table in Espresso Brown. MSRP $190+ tax! In mint condition!